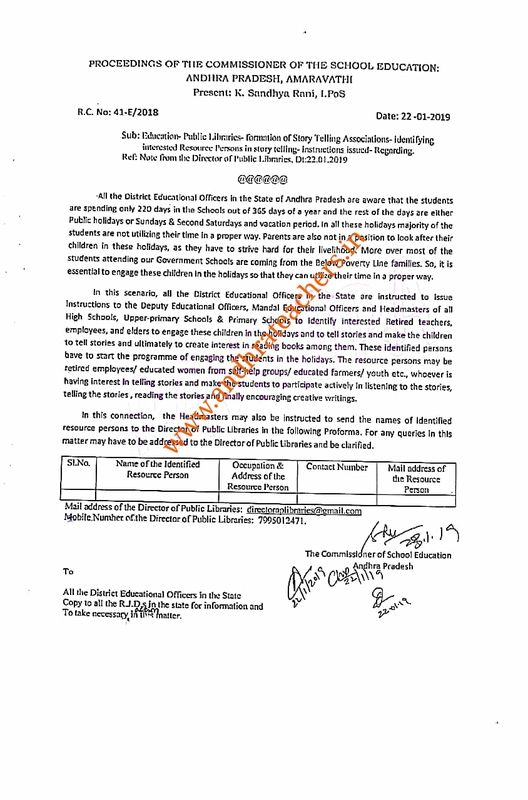 All the District Educational Officers in the State of Andhra Pradesh are aware that the students are spending only 220 days in the Schools out of 365 days of a year and the rest of the days are either Public holidays or Sundays&Second Saturdays and vacation period. In all these holidays majority of thestudents are not utilizing their time in a proper way. Parents are also not in a position to look after their chidren in these hotlidays as they have to strive hard for ther livelhood. ore over most of the students attending our Goverament Schools are coming from the Below Poverty Line familles. So, it isessential to engage these children in th holidays so that they can utilize their time in a proper way. In this scenario, all the District Educational Officers n the State are instructed to issue instructions to the Deputy Educational Officers, Mandal Educational Officers and Headmasters of all High Schools, Upper-primary Schools & Primary hools to tdentify interested Retired teachers, employees, and elders to engage these children in the holidays and to tell stories and make the children to tell stories and ultimately to create interest in reading books among them. These identified persons above to start the programme of engaging the students in the holidays, The resource persons may be retired employees educated women from sel-help groups/ educated farmer/ youth etc, whoever is ing interest in telling stories and make the students to participate actively in listening to the stories, telling the stories, reading the stories and finally encouraging creative writings. In this connection, the Headmasters may also be instructed to send the names of identified resource persons to the Director of Public Libraries in the following Proforma. For any queries in this matter may have to be addressed to the Director of Public Libraries and be clarified. Mobile Numher of the Director of Public Libraries: 7995012471.